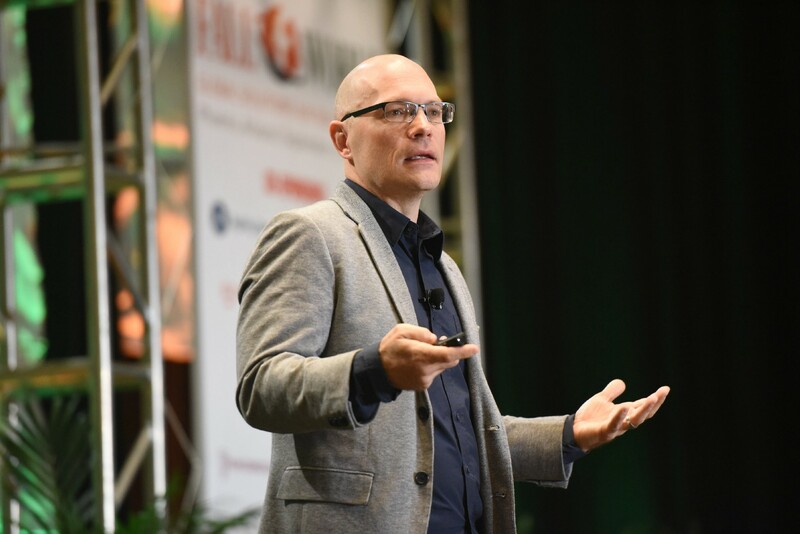 I had the pleasure of interviewing Paul Osincup, who is a speaker and positive workplace strategist who equips people with strategies to create work climates that are more positive, productive and fun. A former university administrator and conflict resolution specialist, it’s Paul’s experience as a stand-up and improv comic that fueled his interest in using humor to enhance human performance. Paul’s TED Talk, “Leading with Laughter: The Power of Humor in Leadership” has been viewed over 160,000 times and his work has been highlighted in Forbes, SUCCESS Magazine, and on his mom’s refrigerator. Paul is the President-Elect of the Association for Applied & Therapeutic Humor, an international organization dedicated to the study and application of humor in professional settings. “Good idea. With the increasing success of AI robotics, it’s smart to start off letting everyone know I’m a human. I live in the San Francisco Bay area, so when I’m not working I love to fish off the coast in my kayak — anything from cod & halibut to a six-foot shark! (I let her go). I get to travel a lot for work but love to do it for leisure as well and just had a great trip to Thailand. I also love to hike and camp with my wife and dogs. “Fortunately for me I find being a speaker to be an ongoing exciting project. I’m constantly creating new material, learning about new trends and listening to what the needs of event planners and organizations are. Oh, and I’m writing a book. I kept telling colleagues I didn’t want to go on to get my Ph.D. because writing a dissertation sounded boring, and now I’m writing a book. “First and foremost is my wife, Kelly. I don’t think I really knew what dedication and strong work ethic looked like until I met her. She worked her way through nine years of post-graduate school to become a board-certified Veterinary Oncologist. For context, there are less people who are Veterinary Oncologists than there are NFL Football players. The hours and sacrifice she put in gave me a new appreciation for what it takes to achieve a long-term goal and be successful. “The second one is a boss who I won’t name. This boss was negative about everything, had very high expectations for people without showing any signs of support, and had no sense of humor. I realized that everyone within the sphere of this supervisor was miserable in their job and was disheartened to see how one person could make going to work so miserable for others. Working for this person was when I realized I wanted to bring more humor, fun, and positivity to people’s work lives, so I quit and started doing what I’m doing now full time. “Humor is an underutilized mindfulness tool for this. For example, last fall my town of Santa Rosa, California suffered from devastating wildfires. I was evacuated from my house for a week, but luckily it was saved. Thousands weren’t as lucky. It was terrible. A day into it as I was at the store looking for breathing masks when they were all out, and many of us were leaving the store without the masks we needed. What are your “3 Lessons I Learned from My Most Memorable Failure”? “One of my first big failures was when I bombed in epic fashion at an open mic comedy night. “Commit. There were certain jokes where it was imperative that I commit completely to the character and give 100% energy, but my nerves caused me to hold back which the audience felt. Always commit fully. “You can’t over prepare. I was well-prepared for what I was going to do that night but didn’t want to go through it too much because I didn’t want to ‘over prepare’. I fumbled around and lost my place a couple of times because I didn’t know my material like the back of my hand. If you’re meticulously prepared you can still improvise, but if the plan is to wing it, you have no structure to fall back on. “Have trusted friends. When I was done, I asked my friend Jeremy what he thought, and he said, ‘Pretty horrible, dude.’ He’s been my best friend for 30 years and I know he won’t B.S. me. “Don’t be boring. Do anything you want, try new stuff, fail colossally, get rejected, etc., but whatever you do, don’t be boring. We’re in an age where there’s more content than anyone can keep up with and boring crap of any genre is the quickest to be ignored. See? This answer is already too long and boring, and you’ve started thinking about something else. “The “3 B’s” of written communication: Be Brief, Brother. “When I’ve had moments of doubt I like to look back on where I began and what I’ve accomplished — just try to put it in perspective. Usually the worries and self-doubt come from comparing myself to other successful people, which is a bad habit. We all get caught up comparing our insides to other people’s outsides and it’s a recipe for failure. Sometimes I’ll watch something I’ve done that I’m proud of or look back on a great testimonial or email I’ve received. A lot of times what quells my anxiety is just getting to work — accomplish one task. This was really awesome! Thank you so much for joining us!